NOTE: I make mini-canes, enough for no more than 3 projects. For a bigger cane, please increase the amounts of clay shown below. NOTE: This is not my “normal” kind of a tutorial, it is mostly text and very brief as many artists have done this tutorial in many ways, I didn’t feel the need to redo all their hard work. 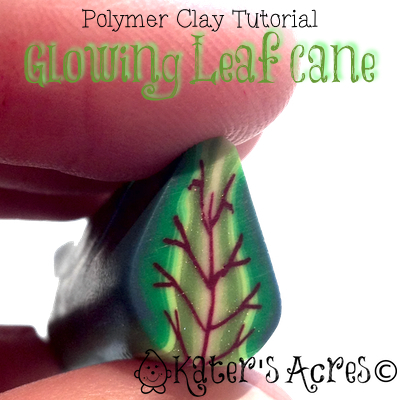 This tutorial uses Tami’s Leaf Cane from Polymer Clay Central as a basis for design. First make a Skinner Blend using the clays above. NOTE: Be sure to lay them out in the same order they are listed above and shown at right. Follow the steps in this tutorial to make a fan folded Skinner blend stack. Cut the stack apart to add the center veins, shown in this tutorial. Once you reassemble the cane and reduce it, you will see the natural “glowing effect” that this cane will give you with the translucent and bright yellow. My personal feeling is that the tiny section of blue on the end adds a touch of life to the leaf canes. If you aren’t in favor of the blue, you can replace it for the same amount of purple for a surprising color shift & effect. If you want less of a glow, try using Wasabi instead of sunshine. The cane will not “glow” as much, but will have a similar effect. I tried going to the second link and it went the same place as the first .Is that rigright? I love the glow effect. Beautiful! When you measure your clay in parts as you do with this recipe, how much clay is “one part” referring to? How large will this make the end-result cane? I write my tutorials in “parts” that way YOU can adjust it to the size of your cane. If you choose to make 1 part, 1 oz. of clay, that is your choice. I make micro canes, so most often “one part” for me is about .25 ounces. There is something I am not understanding about the glowing leaf. Do you use the teardrops as the basis of the skinner blend all at once or is it divided into several blends and then layered together. I am self taught, and my brain is just not comprehending your basic instructions, probably because I’m missing something. I do love most of your tutorials and I love this leaf. I just haven’t figured out how you made it. Hi Jeannie! Thanks for asking & stopping by. Yes, the teardrops were how I made this skinner blend as it was a mini cane. It is done all as one blend, not individual blends. I hope this helps. If not, I’ll do a more exhaustive tutorial soon.